Reading the Arabian Nights in not a simple proposition. Not only, depending on the version you read, is it long to incredibly long, but first you have to actually choose a version. I started with the very good Wikipedia summary of the history of the collection and translation of the stories. You see, the various collectors and translators over the centuries have had different agendas in approaching the tales: make them less baudy, make them more baudy, make them fit another culture’s picture of the Islamic culture they portray, make a literal translation of the language (thus losing some meaning along the way), make the story total reach 1001… It’s complicated. After reading Wikipedia, I settled on the Husain Haddawy (spelling of the name on Goodreads is wrong, by the way) translation which is linked here. Haddawy actually has a great introduction that talks about the history of the stories and makes a good case for the choices he and the author from whom he translated the work made in compiling their version. One of the things that he argues, and I agree with him, is that to do this work justice, the translator has to be at home in both the cultures involved, the culture of the tales and the western culture into which they are translated. That way the translation can be true to the original while rendering the tales in imagery and language that create the effect of the original in the new tongue. I have been very happy with my choice of this translation. The basic premise of Arabian Nights is that a king, betrayed by his wife and hearing of a similar experience from his brother, decides that the only way to have a faithful wife is to marry a woman, sleep with her, and kill her the next day. He is pretty much wiping out the female population of the kingdom when his vizier’s daughter steps in with a plan. She begs her father, who is charged with rounding up wives for the boss, to marry her to the king. The first few stories actually make up part of the argument between the daughter, Shahrazad, and her father, about whether he should accede to her request. Eventually he does, and she marries the king, but brings her sister along, to set up the plan. The sister asks Shahrazad to tell them a story before the night ends, and Shahrazad does, but leaving them with a cliffhanger so that she can live to tell the rest the next night. The process continues this way, with stories within stories and cliffhangers most nights. Shahrazad definitely believes in the power of suggestion, since there are many examples of people being pardoned if they tell good stories or are worthy people. Eventually the king gets the hint and decides that he won’t kill her, and the kingdom is saved. The stories are wonderful little nuggets, many involving enchantment and demons, most also involving beautiful royals and romance. At times they can seem a little repetitive, but they are still wonderful. Haddawy has preserved the pieces of poetry interspersed in the tales which adds to the pleasure of the reading. I recommend taking your time with this collection, as the tales were intended, rather than reading the stories in large gulps quickly over a couple days. It will be much more fun that way. So were there 1001 stories in that version and how long did it take you to read? 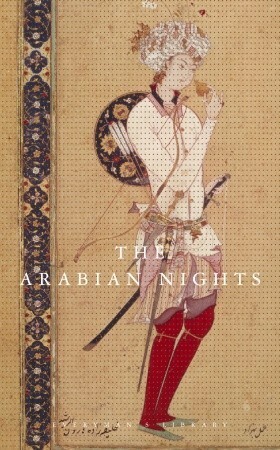 I’ve just ordered Hanan Al-Shaykh’s new version with the beautiful peacock cover, have had it on my list for a while and looking forward to adding it to the short story collection and savouring it.